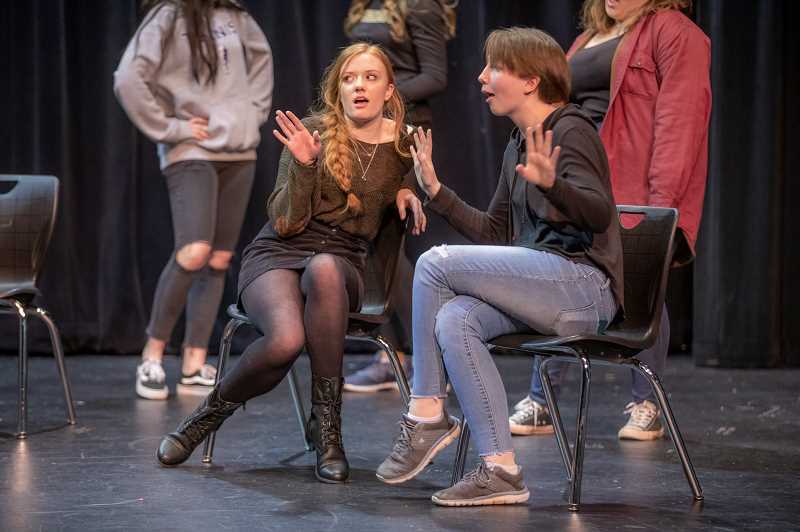 After more than six weeks of preparation, 51 students from Wilsonville High School's theater department will perform more than 40 musical theater and acting pieces at the "Night on Broadway" Thespian Showcase Jan. 31 and Feb. 1 at 7 p.m. in the WHS theater. 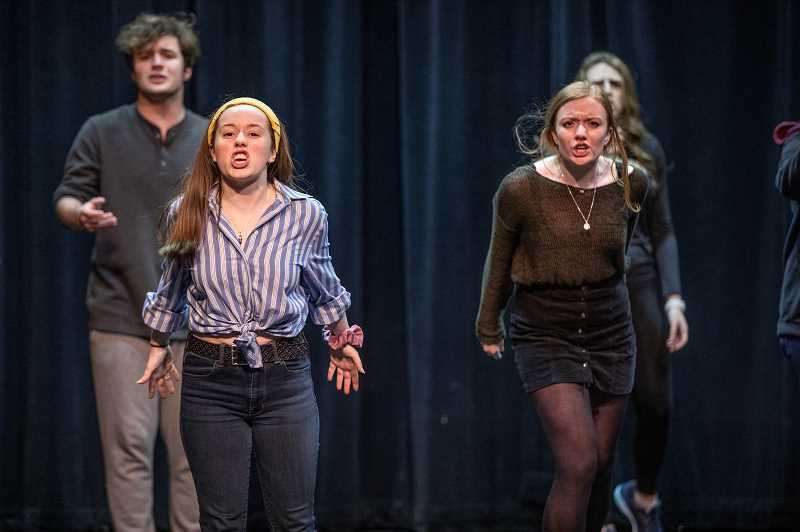 These performances are the community's opportunity to see the musical numbers and acting scenes the Wilsonville students will perform at the Regional Thespian Showcase competition Feb. 2. At the Regional Thespian Showcase, 20 schools will perform a variety of scenes and musical numbers including large group musical numbers, duo musical numbers, solo musical numbers, large group acting scenes, duo comedic and duo dramatic scenes among many others. The top 10 percent of performances from each category in the regional showcase will move on to the state competition. The Wilsonville troupe has seen success at the showcase in years past. "Last year at this competition, we got a pantomime in the (state) showcase. The year before that we got a comedy acting scene in the showcase," WHS drama teacher and co-director of "Night on Broadway" Jason Katz said. To have a piece in the showcase is equal to winning, Katz explained. "The top one or two scenes in every category showcase at state. They don't do a winner really but that's kind of the equivalent of winning," he said. The students performing in "Night on Broadway" feel they can find similar success at this year's showcase. "Everything I've seen is definitely going to do well. Everyone is putting so much work into it and Katz and Fitz (Katz's co-director John Fitzgerald) are working so much that I don't think that there's anything that anyone should worry about," junior Drama Club Officer Mikaela Ochocki said. "It's a star-studded event, "Night on Broadway." Everything that comes on stage has this level of expectation that it's going to be great and I haven't seen an ything that doesn't meet that expectation." Before the Wilsonville troupe could begin rehearsals, or even auditions, they had to select which scenes and numbers they wanted to take to the showcase. A group of drama students spent weeks choosing pieces for each category in the showcase. Selections include musical numbers from "Carrie, The Musical," "My Favorite Year," "John and Jen," "Calvin Burger," "A...My Name Is Alice" and "I Love You, You're Perfect, Now Change." Non-musical scenes were selected from "Rumors," "God's Favorite," "39 Steps," "Of Mice and Men," "Our Town" and many other productions. 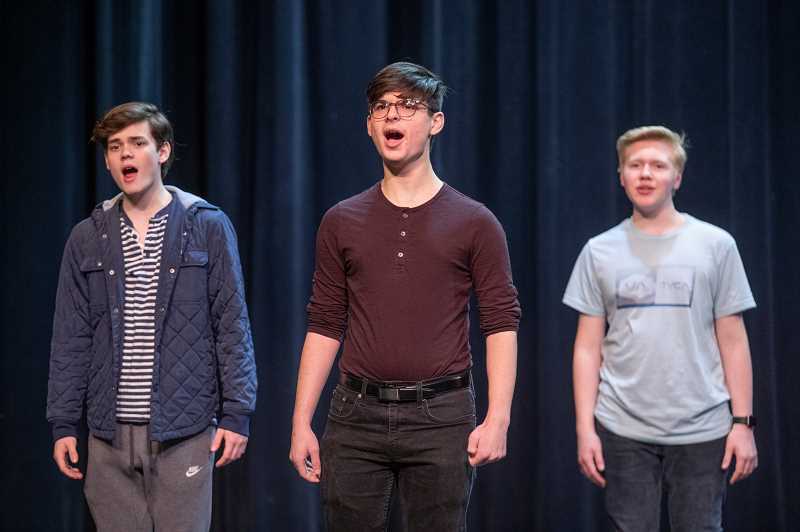 Katz, Fitzgerald and the WHS theater students have had a difficult time squeezing in all the rehearsing they need to do, but they've pushed themselves to make it work. "Scheduling is tough," Katz said. "It's like you need a magician to figure out how you're gonna get every scene time with me or Fitz." The students haven't had it easy either. "It's stressful, especially this time of year," junior Drama Club Officer Casey Young said. "I have three AP classes, I'm in a capella group here and in the show (WHS theater's spring production, 'Much Ado About Nothing') and in regionals and in choir. I used to work as of a week ago but then I quit because it wasn't working for me. I couldn't do it all." Nearly everyone involved in "Night on Broadway" is also involved in "Much Ado About Nothing," which is also in the middle of rehearsals. To make it work, students are putting in hours outside regular rehearsal times. 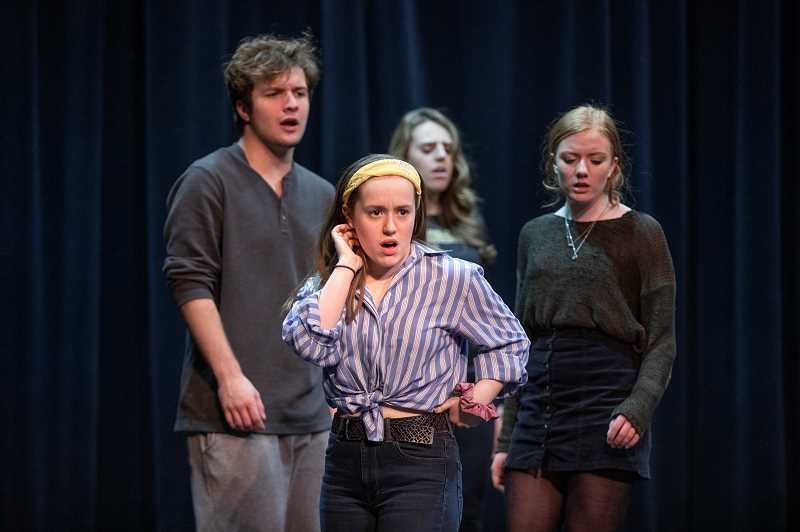 "Over break, we were rehearsing for my musical scenes three or four times," Abi Edwards, a senior Drama Club Officer, said. "A lot of it, the students take on themselves outside of our scheduled rehearsal time." But all of the work is well worth it for the troupe. Young loves the challenge of acting in a variety of roles that the Thespian Showcase presents. "I'm in two musical numbers and one acting scene, which means three different characters, three different personalities, and that really stretches me because they're all different, completely different," Young said. "It's a lot to think about but lets me grow in areas that I never thought about." 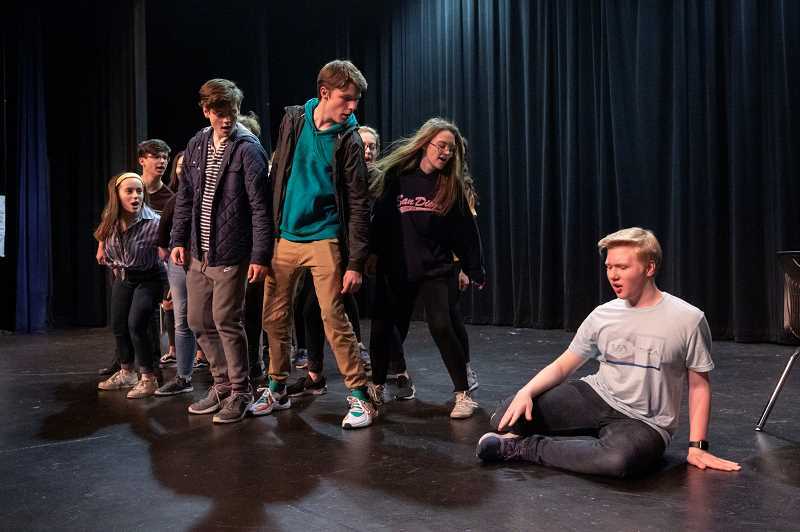 Thespian Showcase serves as an introduction to theater for students who might not be ready to take on one of the school's larger shows. "I meet so many people who don't have the opportunity to do our shows through regionals so it's very cool to see someone begin and grow as actors," Edwards said. "A lot of people started with regionals and now they do everything and they were just too nervous to try a show. It's a great starting point for a lot of people." As part of the Showcase, each of the competing schools throughout Oregon is hosting a feminine hygiene product drive. "At the state thespian officer meeting, we talked about what we want to do for a drive this year. Normally we do socks, but I thought the idea of doing a feminine hygiene drive to end the period-shaming that follows a lot of teenagers," Ochocki said. Donations of new unopened toilet paper, feminine pads, tampons, diapers, diaper wipes, and toiletries like toothpaste, deodorant and nail polish can be brought to the WHS office or to the Jan. 31 and Feb. 1 showings of "Night on Broadway."